mike can assure you the meat sticks taste better than they look! 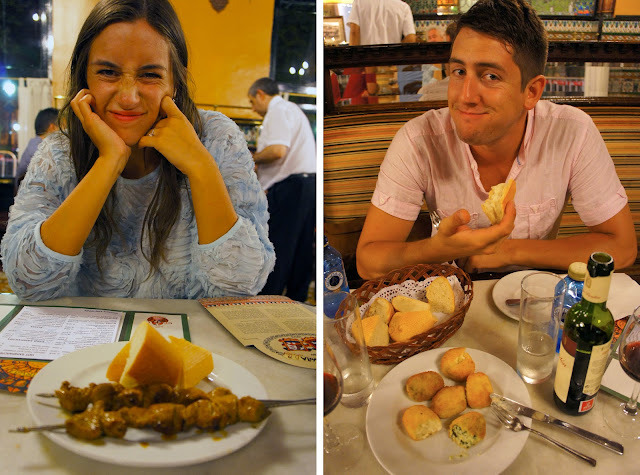 We ate well in Spain. Really well, considering our strict budget (every meal for less than €10 each). This is an adorable little restaurant, covered in warm Mudejar woodwork, paintings, and tiles. There are two adjoining sections: a seated restaurant and a stand up bar. You order hot pintxos (like that meat kebab, or pincho moruno, pictured above) from the grill in one section, and cold pintxos from a waiter or at the beautiful, old bar in the another. Don't let my wrinkled nose fool you. I don't eat much meat, but Mike will testify that the lamb kebabs at Cafe Iruna were amazing. And I couldn't tell you what kind of cold pintxos we ate (I think those squiggly, slimy things were fish?) but they were damn good, washed down with a local red. If you're going to Bilbao I would second Christine's recommendation. Love it! And those squiggly things are baby eels. But, they're probably imitation because real baby eels are apparently outrageously expensive.